Electronic equipment for the process and transportation industries as well as for telecommunication, power generation and distribution utilities are using microprocessors and require continuous DC power in the event of mains failure or mains disturbances. The new BENNING ADC rectifier line with its modular and compact design represents a perfect solution for a wide range of applications in the industrial and telecommunication market. 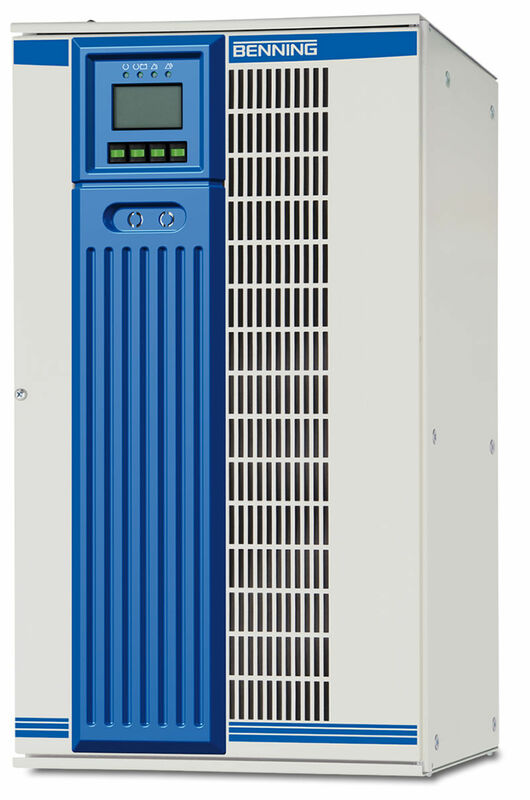 Together with vented or valve-regulated lead acid batteries as well as with NiCd batteries, ADC rectifier systems provide continuous DC power with high availability for mission critical loads. The ADC rectifier line consists of 300 W and 600 W power modules with DC output voltages of 12 V, 24 V, 48 V, or 60 V.
The 600 W module is also available with 108 V (110 V) DC output. Two 108 V modules in serial connection allow the design of DC systems with 216 V (220 V). The output characteristic of the ADC rectifier range follows DIN 41773 (Fig. 1 + 2). The excellent dynamic performance of the ADC range also allows stand-alone operation without batteries.